Description: The flower heads are in terminal panicles and are each surrounded by pearly white bracts with a stiff, dry, straw-like texture. 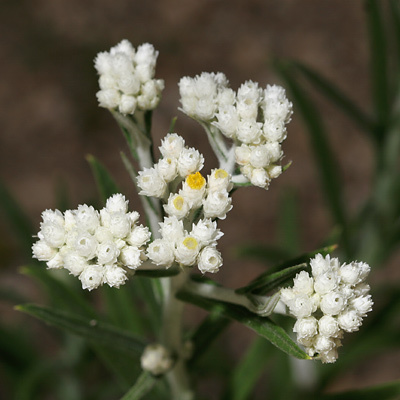 The white, papery bracts around each flower head open to reveal the yellow disk flowers. The leaves are simple, sessile, alternate, linear to narrowly lanceolate in shape, and green to gray-green above and white-woolly below. The plants have slender rhizomes, and the erect above-ground stems are densely covered in white-woolly hair. 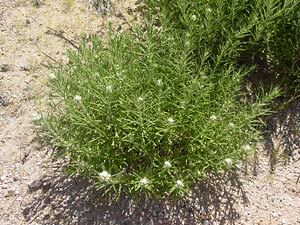 Western Pearly Everlastings are widely cultivated as ornamentals. They are easy to grow in dry, sunny locations and make nice additions to wildflower gardens. Because of their papery bracts, the flowers are everlasting and can be air-dried for use in dry flower arrangements. Butterfly Plant – The plants and flowers attract butterflies and their caterpillars, especially American Lady (Vanessa virginiensis) butterflies.